A parent gives life, but as parent, gives no more. A murderer takes life, but his deed stops there. A teacher affects eternity; he can never tell where his influence stops. Unity is vision; it must have been part of the process of learning to see. [A] friend in power is a friend lost. He never labored so hard to learn a language as he did to hold his tongue, and it affected him for life. The habit of reticence — of talking without meaning — is never effaced. Good men do the most harm. The study of history is useful to the historian by teaching him his ignorance of women. He was the grandson and great-grandson of John Quincy Adams and John Adams respectively. 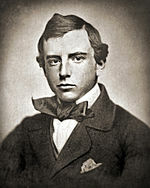 Henry Brooks Adams (February 16 1838 – March 27 1918; normally called Henry Adams) was an American journalist historian academic and novelist.